Home to nearly 4,500, Fairfax is located 20 miles northeast of Burlington. The Lamoille River runs through town and there are spectacular views of Mount Mansfield and Fairfax Falls. Fairfax has an incredibly well run Parks and Recreation Department for a town of its size. A community park and recreation path are open to the public, and several camps, little leagues, fitness classes, annual events such as races and egg hunts are offered. Search below for Fairfax VT homes for sale and real estate by map. Fairfax's median sales price has increased 10.5%. Last years median of $239,900 has now increased to $265,000 in 2017. 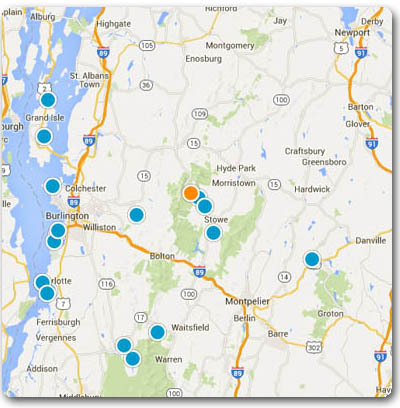 Search below for Fairfax VT homes for sale and real estate by map.